It’s the penultimate day of the London Film Festival and everyone is tired. 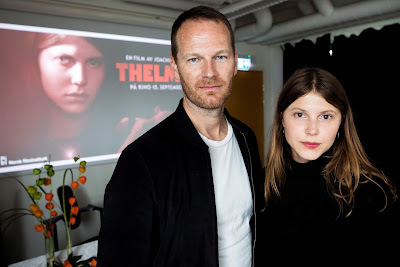 Cinephiles across the capital have the drawn expressions and thousand-yard stares that come from spending weeks devouring dozens of movies, while Joachim Trier is in the middle of an extensive festival tour, having presented his new film in Toronto and New York before arriving in London. Fortunately, Thelma is the kind of shot-in-the-arm movie that we all need at the end of a long festival. A gripping psychological horror focused on a troubled teenage girl, Thelma owes more of a debt to directors like De Palma, Polanski and Hitchcock than you might expect from a filmmaker whose previous work was notable for its quiet introspection. Reprise; Oslo, August 31st and Louder than Bombs displayed Trier’s facility for layering sound and image to create an impressionistic, subjective experience, allowing us to explore his characters’ inner lives, so the outlandish visual spectacle of Thelma, which involved over 200 CGI shots, initially seems like quite a departure.